NCI Tank Eductors are designed for “in-tank” applications. The NCI TLM operates on the principle of flow dynamics pressurized fluid is accelerated through the nozzle to become a high velocity stream that entrains tank contents and intimately mixes with them. This combined stream exits the NCI TLM at a high velocity creating a flow field capable of causing additional agitation and mixing the tank contents. The tank eductor’s motive fluid may come from two sources. The tank liquid may be re-circulated through the eductor via an external pump or a secondary fluid may be introduced into the tank. Gases, as well as liquids, are used as the secondary fluid. Aeration and gas dispersion for chemical reactions are common uses of gas motive systems. Liquids are typically additives to be mixed with or to dilute the tank contents. Limited resistance (moderate attack and suitable for short term use only) to Aromatic and Halogenated Hydrocarbons and Oxidizing Agents. Most efficient operation takes place when inlet pressure is within the range of 20 to 70 psig (140 to 480 kPaG). Four gallons of tank contents can be mixed for every gallon of operating fluid. For inlet pressures outside this range, tank contents mixed will be reduced. A NCI TLM can be mounted in any position. 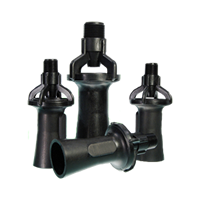 The supply line and manifold piping to multiple TLM’s must be sized to supply uniform pressure to each TLM. It is important that the TLM be positioned within the tank so as to insure the free flow of liquid to be mixed into and out of the unit(s). The greatest agitation occurs within the discharge plume; therefore, the discharge end should be aimed towards the most remote part of the tank. On the other hand, the intake end of the unit must be far enough from the tank corner or wall to allow the free flow of liquid into the suction openings. Tank shape and size influence the placement and number of TLM’s required to maintain even agitation or temperature distribution. With no corners to impede liquid flow, the liquid circulates evenly. In a cylindrical, square, or rectangular tank, the angular intersection of surfaces can interrupt liquid flow patterns and cause liquid stagnation in these areas. Whenever the ration of length to diameter of the tank is greater than 2:1 (such as tank trucks or railroad cars), it is recommended that multiple TLM’s be used. In tanks where a critical velocity must be maintained on the tank bottom, a slight downward angle of the TLM’s can be helpful. KYNAR® (PVDF) is a high molecular weight thermoplastic polymer with excellent chemical inertness. It is highly resistant to oxidizing agents and halogens and is almost completely resistant to allphatic, aromatics, alcohols, acids and chlorinated solvents. It is resistant to most acids and bases. Mechanically strong. High dielectric strength. Thermally stable. Resistant to low temperatures. Stable to ultraviolet and extreme weather conditions. Self-extinguishing and non-toxic. Tensile modulus (ASTM D 638) : 3.5×10~5 p.s.i. TLM00MP -PP -KN 1/4" NPT Male 3-1/8" 1-1/2"
TLM0MP -PP -KN 3/8" NPT Male 4-1/2" 2-1/8"
TLM2MP -PP -KN 3/4" NPT Male 6-3/8" 3"
TLM3MP -PP -KN 1" NPT Male 8-1/2" 3-3/4"
TLM4MP -PP -KN 1-1/2" NPT Male 9-7/8" 4-5/8"